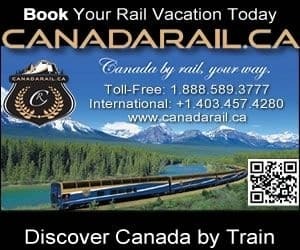 Glacier Gulch Trail in Smithers, British Columbia, Canada can be a muddy, steep hiking experience navigating rock cliffs and the muddy slopes up to the glacier on Hudson Bay Mountain. From the glacier, the views open right up looking out over the surrounding valley and providing views of Hudson Bay Mountain. All hikers who enjoy the views must break a sweat navigating an elevation gain of over 1000 metres to the glacier. The trail follows a mostly earthy path leading straight up for about 4-5 kilometres to various points on the glacier. Sections of the route involve high stepping tree roots and side stepping rockfalls. The trail is never easy and is always challenging. And being that the route is under a glacier the trail is very moist during most months of the year therefore very slippery. The entire trail should take 2 -3 hours one way. Fitness, time and destination on the glacier determine the length of the hike. It is very important to know that most accidents happen when coming down mountains... this is no exception plus it is slippery and rocky. Be careful. Once on the glacier be aware of the crevasses and snow caves hidden under the glacier. It is always best to stay on the path and never vary far from it when exploring the glacier. When planning on hiking the Glacier Gulch Trail please make sure to bring warm clothes because as the elevation goes up the temperature comes down. It can become cold quickly. The Glacier Gulch Trail provides all explorers a bonus trip. An opportunity to view a freak of nature in a pair of waterfalls. From the gulch trail or as a short detour hiking trip the Twin Falls can be seen crashing to the ground. 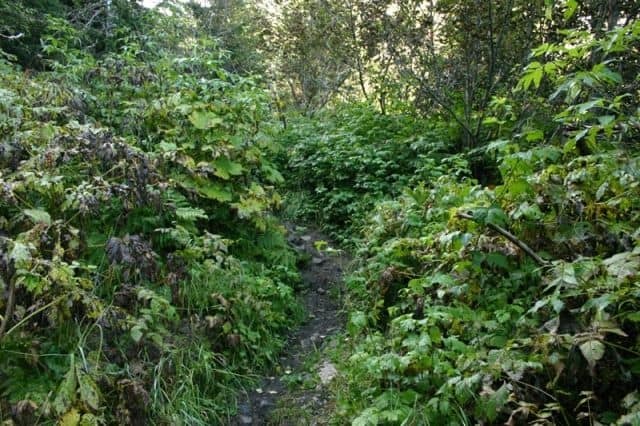 The short trail to the Twin Waterfalls are accessed from the same parking lot as the Glacier Gulch Trail. At the recreation site where the parking lot is located there is a fire pit, creek and picnic area under the trees. From the parking lot take the main trail to Twin Falls, A short few hundred metres ahead on your left is the trailhead up to the glacier. 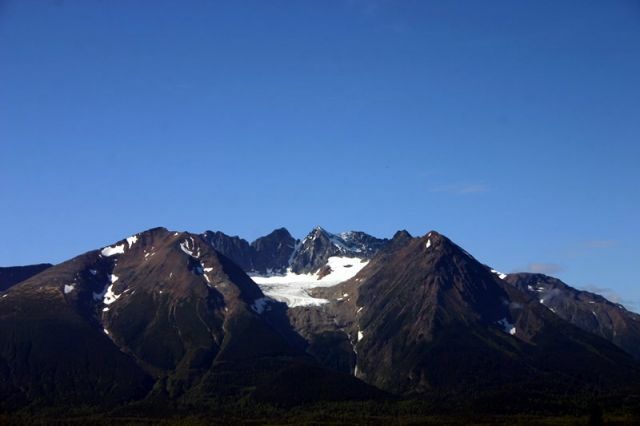 How to Get Here: Travel Highway 16 west of Smithers, British Columbia, Canada for about 4 kilometres and take a left. 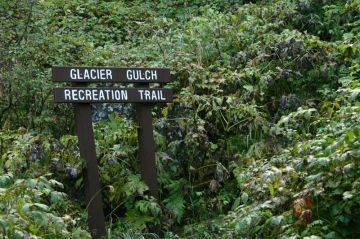 Follow the signs to "Glacier Gulch and Twin Falls". Turn left from Hwy 16 onto Lake Kathlyn Road. Continue driving crossing over the railway tracks and turning left on to Glacier Gulch Road. The recreation site and parking lot is ahead.